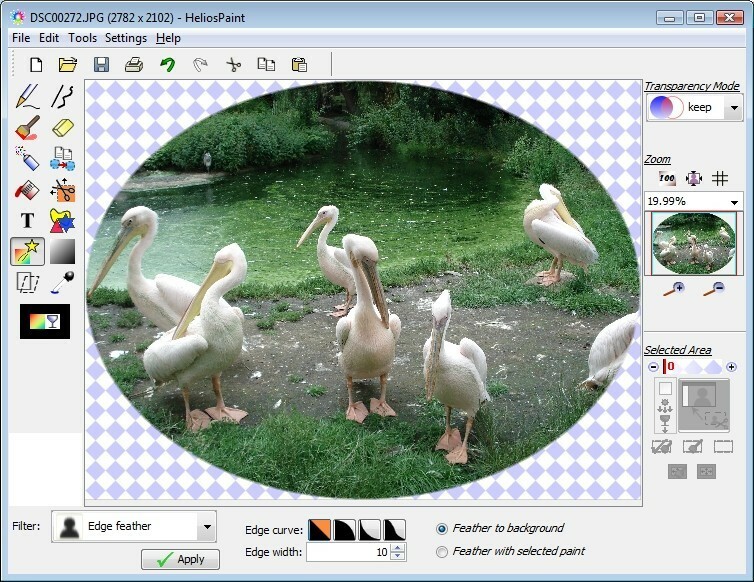 HeliosPaint is a feature-rich, easy-to-use and powerful paint program for editing photos, drawings and icons on Windows PCs, laptops and touchscreen PCs. It is simple to learn and has a range of standard and advanced tools including: Pencil. Curved, straight and freehand lines with a choice of width, dash pattern and arrow head. Paint Brushes and eraser with adjustable size and edge feathering. Spray Can. Copy Brush for copying one area of an image to another for retouching, healing and blending. Paint Can with local and global replace (color bleed sensitivity allows nearby similar colors to be painted). Shapes tool for creating freehand, round, regular polygon, star, moon and heart shapes. Text entry with a choice of font, style, spacing, underline and rotation. Image filters: RGB levels, HSB levels, HSL levels, gamma, transparency, channel mix, temperature and tint, contrast, gain and bias, threshold, black and white, invert, solarize, gray, color filter, sepia tone, sharpen, unsharp mask, blur, diffuse, edge feathering, edge detection, oil painting effect, posterise, emboss, chrome, noise reduce. Image color and transparency adjustment by flat, round, rectangular and 'fit to shape' gradient patterns (this allows areas of the image to be darkened, brightened and color enhanced). Image flip, scale up, scale down, rotate, shear, perspective view. Full color pallet with adjustable transparency and color grabber. Fully opaque, part transparent or fully transparent background colors. Full texture paint support. High level zoom for easy icon or transparent icon editing. Scissors, lasso and wand for selecting, moving or exporting an area of an image (when part of an image is selected, all paint operations apply only to that area). Transparent PNG and transparent GIF file editing. Undo and redo. Printing with auto fit to page. Export image to PDF file. Simple and easy to use help file. The help file can be read in a few minutes and covers and explains every process.